Pilot Knob is an eye catcher. It's evocative of the buttes out west such as those in Monument Valley, AZ or Devil's Tower in Wyoming. The Mountains to Sea Trail has recently been rerouted to take a wide swing around the slopes of Pilot Knob. It doesn't get too close to the summit, or even to the base of the daunting wall surrounding it because the trail that gets close is not a through-trail, but a loop, and because there's no trail to the summit at all. In the 70's an existing metal stairway was dismantled when it became unsafe. Bottom line: the MST does not get as close to the mountain as the photo above shows. 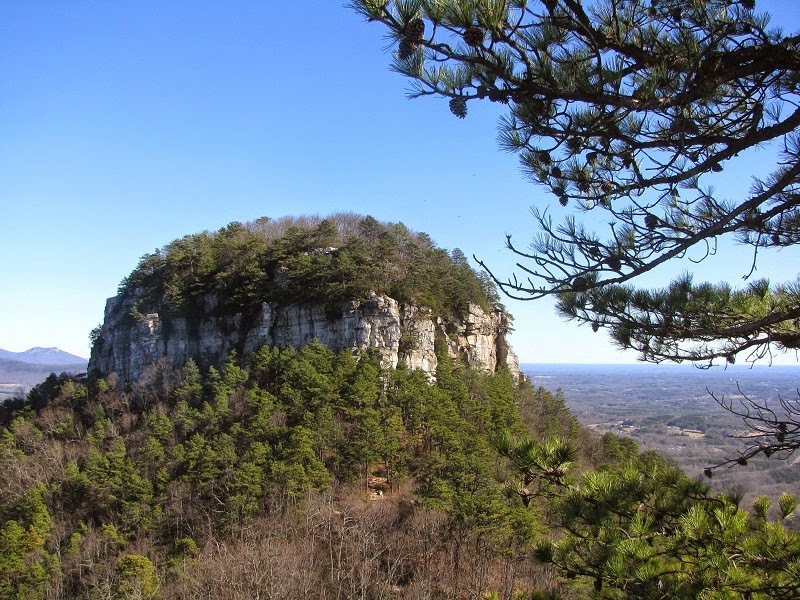 That photo was taken from Little Pinnacle Overlook, a heavily used access point that is just a short walk from the upper parking lot at the end of the park road. And as you can see from the bare trees, this photo was taken at another time--when I visited the park in January 2012 on my way back from a short break in my Appalachian Trail thru-hike. 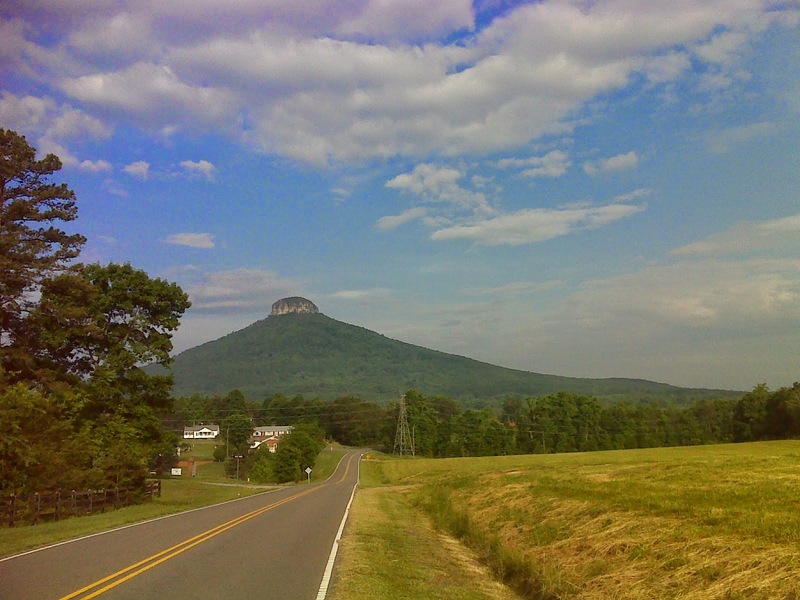 The peak of Pilot Knob is over 2400 feet in elevation. The Mountains-to-Sea Trail route gets no higher than about 1600 feet, so it's a significant side trip to get up to the overlook area, but if the visibility is good, I'd recommend it. The MST uses the red blazed 'Mountain Trail' that and the blue blazed 'Grindstone Trail' to circumnavigate the mountain. The Mountain Trail is being upgraded - rerouted and lengthened to include a little longer route and to avoid some eroded sections. I hiked this new route today although it is not finished or officially opened yet; and it's a nice improvement. For the westbound MST it departs from the blue blazed Grindstone Trail about a mile from the Park Office/Visitor Center at this fork. 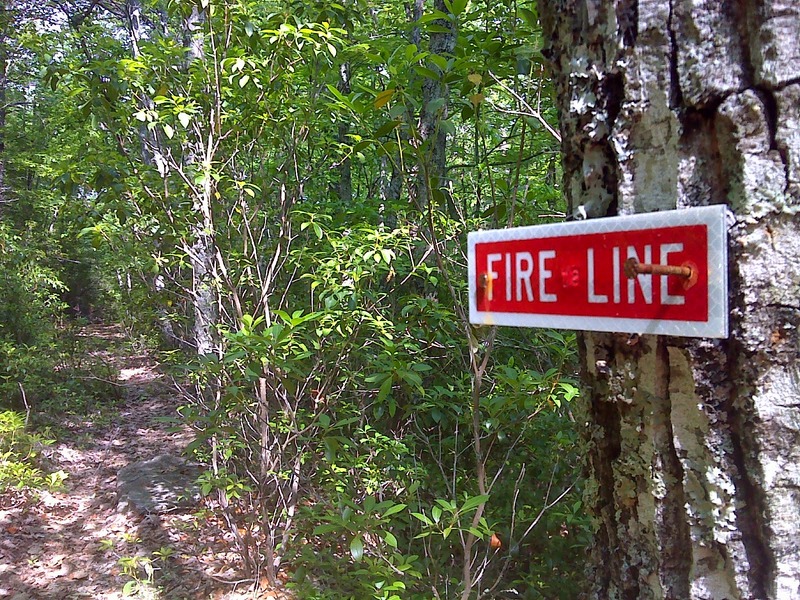 The right fork is the Fire Line woods road, occasionally marked with these 'blazes'. Where the Fire Line road dead-ends a new trail route has had the brush partially cleared and is marked with red surveyor's flags (little plastic rectangular flags on metal stems) stuck in the ground. This new section runs for a whole mile and almost precisely follows the 1500 foot elevation contour around the mountain until it intersects with the existing red blazed 'Mountain Trail' where it comes down some steep, eroded, rocky trail from the Grindstone Trail. I'm not recommending that hikers follow the unfinished new route because they could get lost. But the GPS track I produced by hiking it shows the future route. To hike the current route, I suggest that the hiker get the latest information from the park office. They have a first-class free map showing topography and all the existing trails in great detail. It's much, much better than the maps available online. It's easy for the westbound hiker to stop in and get one of these maps as they enter the park from the Sauratown Trail. The eastbound MST hiker doesn't have that luxury. 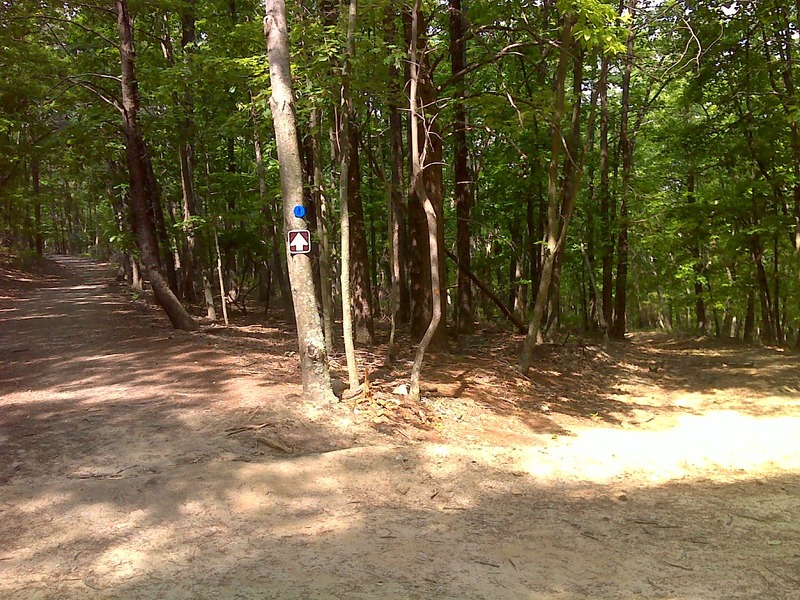 The rest of the MST route through the park is on a wide, almost road-like rolling gravel horse trail through the woods. 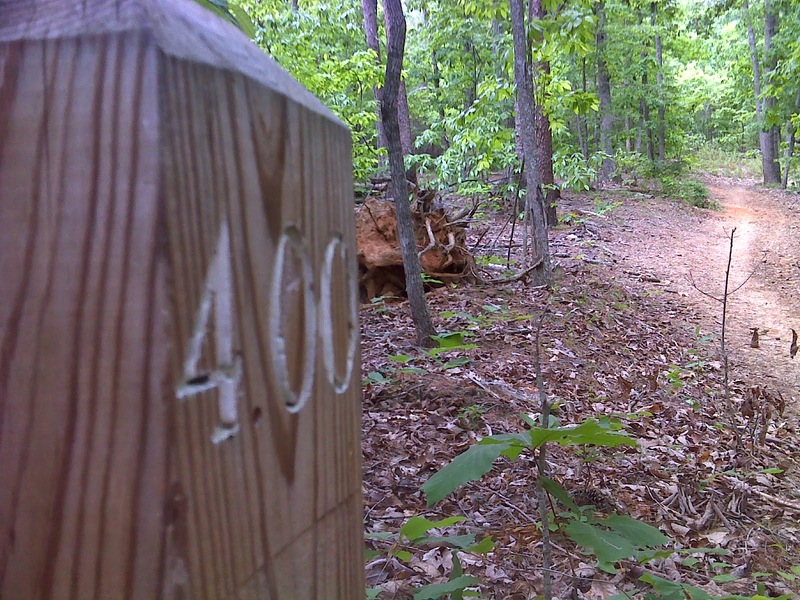 This is called the Corridor Trail, and it follows a narrow strip of park property for 5.6 miles between Pilot Mountain and the Yadkin River. Only this part of the park trail is currently signed and white-circle-blazed as the MST. In addition it is marked along the way by engraved wooden mileposts. Just as the MST does not go near the summit of Pilot Knob, the MST doesn't get close to the Yadkin River either. Westbound it leaves the park at Hauser Road beside the huge horse trailer parking lot. That road walk -- about two days to the town of Elkin -- begins tomorrow for me. 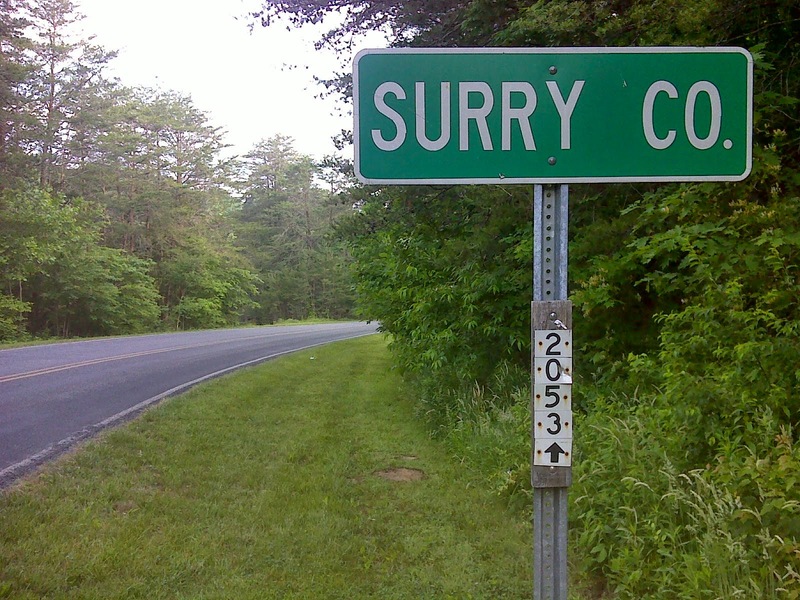 I hiked out of Stokes County and into county number 18 of my westbound Odyssey. 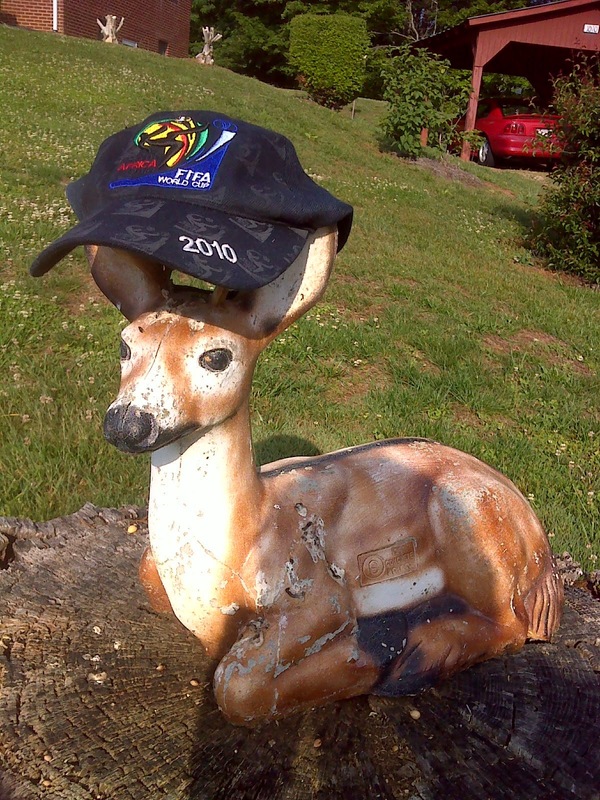 And the route took me past a willing subject who agreed to pose with my 'Hat of the Day' perched on his antlers. 'Hat number Five' is another trail find - found near Bearfence Mountain on the AT in Shenandoah National Park in early October 2012. It commemorates the previous soccer World Cup, held in South Africa in the summer of 2010. I'm a big soccer fan, and plan to work my hiking schedule around the 2014 games, which take place in Brazil beginning in just 2 1/2 weeks. I can't wait. It's a once-in-four-years event, like the Olympics. And for the rest of the world it's as big or even bigger than the Olympic Games - arguably the most important sporting event on the planet. Here's a map of the route I hiked through Pilot Mountain State Park - another reminder that this route is partially on trail that is still under construction, so not recommended for others to follow until it is opened.